To show off the functionality of its three staple luggage pieces, Louis Vuitton has created an interactive online demo where customers can pack the luxury travel bags themselves! 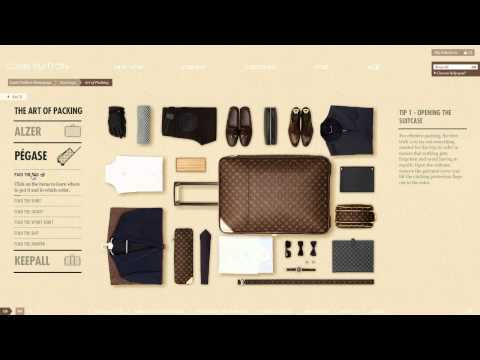 The Art of Packing experience is hosted on Louis Vuitton’s website under the travel section and is meant to show customers how to efficiently pack the luxury travel collection. Not only does the game demonstrate how many items are able to fit in the bags, it actually gives you specific instructions as to how to pack certain items including the more difficult ones, like dresses and jackets. This game is a great way to show customers that even though the luggage is a ‘luxury’ piece it’s still just as practical as your everyday suitcase – which is no doubt the purpose behind the packing experience. The game is also a great way for customers to see which LV luggage piece best suites their travel needs. Helping inform the customers about the advantages of each piece is a blurb of info in the top right hand corner, stating what the piece is best used for and its unique traits! Check out the video below to see what exactly The Art of Packing is, or try the game out for your self right here.